Scheme 3. Illustration showing that a non-polar prodrug (PD) of a polar drug (D = ) may show less than complete oral availability due to premature cleavage in the GIT or the enterocytes. quantitative availability. This is illustrated in Scheme 3. The ideal prodrug of a polar non-absorbable parent is one that is chemically and enzymatically stable in the lumen and the enterocytes but is then quantitatively and selectively cleaved on reaching systemic circulation. If cleavage occurs in the entrocyctes diffusion or efflux of the parent back into the lumen is possible and highly probable since there is just as much driving force for the drug to go in that direction as there is for systemic delivery. Adefovir dipivoxil was developed and approved as a bis-pivalate for the treatment of hepatitis B after an initial trial for the treatment of AIDs. Because of the lower dose needed to treat the hepatitis B indication, the amount of pivalic acid formed during the prodrug deprotection did not result in sufficient carnitine depletion to be of concern. Like the tenofovir prodrug, oral availability of the prodrug is good and results in effective therapy. Adefovir dipivoxil and tenofovir disoproxil metabolism results in the production of two moles of formaldehyde. Company toxicologists and regulators often raise concern about formaldehyde production especially since it gives a positive Ames test. There are numerous marketed prodrugs that form formaldehyde, fosphenytoin is a good example (Stella, 1996c). Nevertheless, each time a formaldehyde-producing prodrug is proposed, new concerns are raised. Taking 300 mg of tenofovir disoproxil per day exposes one to 0.035 grams of formaldehyde. To place this into perspective, two glasses of red wine will expose you to about 0.040 grams of methanol/formaldehyde. Yes, one must be concerned with excessive formaldehyde exposure, but by any reasonable estimate most prodrugs will not add significantly greater methanol/formaldehyde/formate exposure than that seen in normal input from diet and the environment. Two earlier marketed nucleoside antivirals are acyclovir and gangciclovir. Both are absorbed from the GIT but on a limited basis. Their limited permeability across the GIT mucosa is the result of their high polarity. Numerous efforts to improve oral availability by the innovators and various other research groups focused on the simple mono-esterification of acyclovir or mono- or bisesters of gangciclovir (Martin et al., 1987). The discovery by Burrows Wellcome scientists that the L-valine ester of acyclovir (valacyclovir, Valtrex®) gave superior performance compared to other esters was surprising and was initially attributed to the combination of solubility and lipophilicity enhancement of the prodrug compared to the parent (Beauchamp et al., 1992). It was not until later that it was discovered that valacyclovir was actively transported across biomembranes by the di- and tripeptide transporter (Balimane et al., 1998, Han et al., 1998). Similar results were observed with the L-valine ester of gangciclovir (valgangciclovir, Valcyte®) (Sugawara et al., 2000). Of note is the better performance of the monoester compared to the bis-ester (Hans Maag, personal communications). Valacyclovir is an example where "lady luck" plays a role and illustrates the role that serendipity plays in the drug discovery process. Is the choice of L-valine esters one that someone would make from first principles? It is unlikely, but the discovery and development of valgangciclovir was influenced by the observations made with valacyclovir. Relenza® or zanamivir is a neuraminidase inhibitor useful for the treatment of influenza, but, because of its high polarity, is only available in an inhaler form. No oral form is available. When developing oseltamivir (Tamiflu®, Gilead Pharma), another neuraminidase inhibitor, not only did the product have to compete against zanamivir, but the preferred route of administration of most medications in most of the world is oral delivery. As an ethyl ester, oseltamivir is well absorbed orally in man and readily breaks down to its active form, oseltamivir carboxylate (GS-4071), in vivo. GS-4071 only showed an oral availability of 4.3 ± 1.6 % in rats. Significant animal species differences were observed in bioavailability after oral dosing of the prodrug, with 30%, 35%, 11% and 73% bioavailability in mice, rats, ferrets and dogs, respectively (Li et al., 1998). The bioavailability in man is around 40-50%. Breakdown of oseltamivir is due to the action of esterases resulting in production of small quantities of ethanol. As an oral product, oseltamivir appears to have had a greater commercial impact than zanamivir, while the discoverers of zanamivir should be credited with pioneering this novel route of influenza treatment. Three additional drugs were recently approved for which the use of a prodrug modification resulted in commercially viable products of parent drugs that were polar. Two that use the same promoiety are olmesartan medoxomil (Benicar®), an antihypertensive agent, and prulifloxicin (Sword®), an antibacterial. Both these agents use the (5-methyl-2-oxo-1,3-dioxol)methyl promoiety. In one case, it is used in the form of an ester and, in the second case, it is used in the form of an N-alkylation of a secondary amine group. In the case of olmesartan medoxomil, protection of the acidic carboxyl group allows for acceptable absorption of the deprotected antihypertensive active. 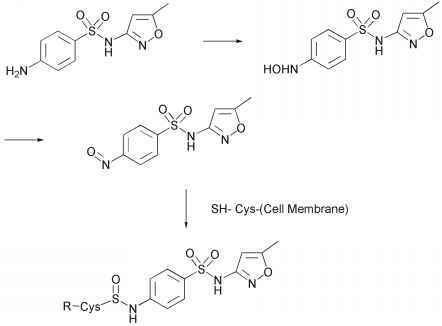 The mechanism of deprotection of the (5-methyl-2-oxo-1,3-dioxol)methyl promoiety, first used, to my knowledge, as a promoiety for altering the polarity of penicillins and cephalosporins in the mid-1980s, has been proposed to be first, esterase cleavage of the cyclic carbonate linkage, followed by an elimination reaction (Ikeda et al., 1984, Sakamoto et al, 1984). This results in the formation of the parent drug, carbon dioxide and 2,3-butanedione. When attached to the secondary amine group, as in the case of prulifloxicin, some have suggested a more complex mechanism involving N-oxide formation of the tertiary amine formed by the N-alkylation by the promoiety (Kondo et al., 1989). Ximelagatran (Exanta®) is an anticoagulant. Although approved in Europe, it recently was turned down for approval in the USA. The innovator was asked to supply additional supporting data. Ximelagatran is a double prodrug, whereby a carboxyl group is protected as an ethyl ester and the benzamidine functionality is in the form of an N-hydroxyl moiety. The parent drug, melagatran, has an oral availability of only 3-7%, while ximelagatran results in an oral bioavailability of melagatran of about 20% (Gustafasson et al., 2001). Melagatran is zwiterionic, with an anionic carboxylate group and cationic benzamidine group, accounting for its poor permeability from the GIT tract. Gustafasson (2003) has shown, on oral dosing, that ximelagatran produces two intermediates. One is ethylmela-gatran resulting from the reduction of the -N-OH to -NH2, but with the ethyl ester moiety intact and melagatran-OH, where the ethyl ester group is removed, presumably via esterase action, but the -NH-OH has yet to be reduced. Neither is present in plasma in high concentration. There are not many commercialized prodrugs that were designed to overcome the poor oral availability of solubility-limited drugs. A good older example is Merck's non-steroidal antiinflammatory drug (NSAID, sulindac. Sulindac is an S-oxide prodrug of its reduced parent sulindac sulfide. As the S-oxide prodrug, sulindac has superior solubility and lower GIT toxicity than the sulfide and was promoted as a less corrosive NSAID (Shen and Winter, 1977). A more recent example is fosamprenavir, a phosphate ester of the HIV protease inhibitor, amprenavir (Anon. 2003; Hale et al., 2002). Amprenavir is a high dose drug with marginal water solubility. To achieve adequate oral availability, the drug was formulated as a soft gelatin capsule containing 150 mg of drug. Because the dose of amprenavir is 1,200 mg twice a day, eight capsules, taken twice daily, were required for therapy. It can be readily agreed that eight capsules twice a day is not convenient and could lead to patient compliance issues. The innovators synthesized a phosphate ester prodrug, calcium salt, fosamprenavir (see Table I). Fosamprenavir has very good water solubility and is readily formulated as 700 mg tablets (molar equivalent of 600 mg amprenavir). Fosamprenaviir shows an oral biavailability equivalent to the amprenavir capsules. If fosamprenavir is so water soluble, isn't polarity a problem? The dianionic fosamprenavir is not absorbed intact. The surface of the enterocytes lining the small intestines is very rich in alkaline phosphatases. These embedded enzymes are capable of hydrolyzing fosamprenavir to amprenavir right at the intestinal cell surface. Since amprenavir is readily permeable, it is well absorbed. This coupling of metabolism and absorption is readily seen with the absorption of folic acid from food sources (Rosenberg, 1981) and has been proposed much earlier as a prodrug strategy by others (see Fleisher et al., 1985; Heimbach et al., 2003). Phosphate ester prodrugs appear as some of the better examples of the prodrug technique as a means of increasing the oral availability of solubility-limited drug molecules. The use of water soluble prodrugs of poorly water soluble drugs to effect parenteral dosing has been an accepted solution to solubility limitations since its application in the 1960s to the antibiotic chloramphenicol as chloramphenicol hemisuccinate, sodium salt (Glazko et al., 1973; Nahata and Powell, 1981), and the hemisuccinate and phosphate esters of various steroids (see various earlier reviews for references). In 1996 fosphenytoin was approved as a water soluble and safe injectable form of phenytoin (Stella, 1996c). More recently, two novel prodrugs are parecoxib sodium (Dynastat®), which is the injectable form of valdecoxib (Bextra®), and fosfluconazole (Bentley et al., 2002), a phosphate ester prodrug of fluconazole, both of which were approved for parenteral use (see Table I). Ueda et al. (2003) recently described some novel phosphate ester prodrugs of another clinical antifungal drug. Parenteral formulations of poorly soluble drugs can present some unique challenges to prodrug scientists. First, solubilities greater than 10 mg/ml are often needed, thus for truly poorly soluble parent drugs, orders of magnitude increases in solubility are needed. Consider the phenytoin/fosphenytoin example. Phenytoin has a solubility of about 25 |g/ml while an injectable dose of 50 mg/ml (as sodium phenytoin) or about 47 mg/ml phenytoin equivalent would have to be matched by a prodrug. Fosphenytoin met that goal without the need for co-solvents. Having met the solubility goal, the second problem was aqueous stability. While fosphenytoin showed excellent chemical stability, it, along with all parenteral prodrugs, suffers from the fact that the most likely degradants of these prodrugs are the poorly soluble parent drugs. Thus the shelf-life of the prodrug in aqueous solution is often dictated, not by the time to lose less than 10% of the prodrug, but by possible precipitation of insoluble degradation products. Therefore, some water-soluble prodrugs of insoluble parent molecules must be formulated, not as ready-to-use solutions, but as freeze-dried powders for reconstitution prior administration. Fosphenytoin is sufficiently stable to allow for a ready-to-use solution, but it does require refrigeration. An alternative room temperature stable formulation has been proposed (Narisawa and Stella, 1998). Aquavan (see Table I) is a water-soluble prodrug of the anesthetic agent, propofol (Stella et al., 2001). The promoiety, in this case, is identical to that used for fosphenytoin, except that the phosphonoxymethyl group is attached to the sterically hindered phenolic group of propofol. The pharmacokinetic properties of aquavan in rats and humans (Schywalsky et al., 2003; Fechner et al., 2003) have been shown to be quite interesting. This drug recently entered phase III clinical trials in the USA. Aquavan was designed to overcome the limitations of the current propofol formulation, where the drug must be administered in a 10% oil/water emulsion. The limitation is low concentration, requiring large volumes of the emulsion to be administered when used to maintain a coma. This can result in lipid overload. Brachial pain on injection, emulsion cracking during long term infusion, and difficulty in maintaining formulation sterility, due to the emulsion being a very good growth media for bacteria, are other limitations. Aquavan is very water-soluble, so no lipids are required and more concentrated solutions are possible. It is rapidly converted to propofol in vivo, both in animal models and humans; thus, there is a rapid onset of anesthesia. Since the injection site only sees the inert prodrug, there is no pain on injection. The injection is in the form of a ready-to-use solution and is easy to maintain in a sterile state.